In 1999, The Independent published an article entitled “World’s top sweetener is made with GM bacteria,” which revealed that Monsanto was knowingly adding aspartame to soft drinks in the United States – and that aspartame is made from GM bacteria. This report, which remains one of the earliest disclosures on aspartame in a mainstream newspaper, received little attention after its publication – possibly because its implications were underestimated at the time – and it has long been forgotten. Since 1999, the world has become a little more attentive to Monsanto and aspartame, but ignorance still abounds about the latter’s genesis. While more and more people are starting to awaken to aspartame’s destructive effects on our health, do they know how it is actually made? Fortunately, a 1981 patent for aspartame production, once confined to the drawers of patent offices, is now available online for everyone to see – and it confirms everything that Monsanto was happy to tell us in 1999 before their meteoric growth necessitated greater prudence. 1.) ‘Cloned microorganisms’ (which the patent later reveals to be genetically modified E. coli) are cultivated in tanks whose environments are tailored to help them thrive. 3.) The proteins containing the Asp-Phe segments are ‘harvested’ (i.e. lab assistants collect the bacteria’s feces). So there we have it: An official document that not only reveals the shocking truth behind aspartame production, but also freely admits that it was intended for mass consumption as a sucrose substitute. 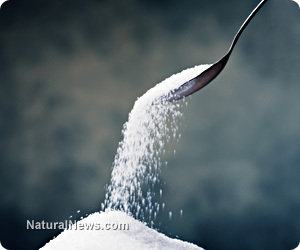 Therefore, the next time someone claims that your reservations about this sweetener are unfounded, direct them to this patent – the truth behind aspartame is now in plain view. Michael Ravensthorpe is an independent writer whose research interests include nutrition, alternative medicine, and bushcraft. He is the creator of the website Spiritfoods, through which he promotes the world’s healthiest foods, whether they be established superfruits such as mangosteen or lesser-known health supplements like blackstrap molasses. Tagged aspartame, GMO. Bookmark the permalink.